UVA**** superior. Durable up to 10 hours. Highly water resistant. Unique lightweight formula. Ideal for the whole family. UVB/SPF 50 high protection. 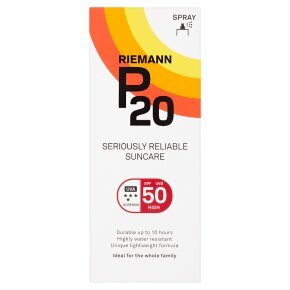 P20 Sunscreen: P20 is a highly reliable and very water resistant sunscreen with a unique transparent lightweight consistency. Ideal for the whole family, it contains photostable UVA and UVB filters, but no added fragrances or colourants. It includes UVA protection at a level that far exceeds EU recommendation and is rated 4 out 5 stars. Clinical testing shows that P20 is durable up to 10 hours and that intact protection is maintained even after 4 x 20 minutes in the water. Apply generously and evenly 15 minutes before going out in the sun to ensure no missed areas and sufficient coverage. Applying less sunscreen will significantly reduce protection. Do not stay too long in the sun even when protected. Avoid intense midday sun (11am to 3pm). Avoid contact with fabrics to help prevent staining. Follow the enclosed instructions carefully to ensure full benefit.